WASHINGTON (AP) - Tracy Martin, father of the Florida teenager shot dead by George Zimmerman, told black lawmakers he will dedicate himeslf to creating an alternate legecy for his son, beyond the trial and media storm that followed the youth's death. The elder Martin hopes the effort will help prevent similar discrimination and stereotyping currently experienced by many African-American teenagers like Trayvon. "I always say Trayvon was my hero. He saved my life. 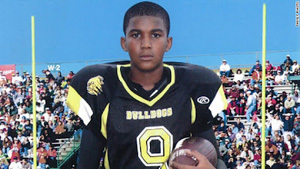 Not to be there in his time of need is real troublesome, not to be able to save my son's life," Tracy Martin said. Martin opened comments by a panel of experts brought together by House members who formed the Congressional Caucus on Black Men and Boys to focus more attention on issues disproportionately affecting black men and boys. Some of those issues include unemployment, incarceration and racial profiling. Trying to counter what he described as slander against his son, Martin said he wouldn't allow the verdict to sum up his son. "I vow to do everything in my power not to give up the fight for him, not only the fight for Trayvon but for so many other young black and brown boys in this country," he said. Congressional caucuses are made up of members of the House who share interest in a given issue and want to focus attention on it while suggesting possible legislative responses. They include special group caucuses such as the Congressional Hispanic Caucus and the Congressional Caucus for Women's Issues. Martin's appearance came a few days after President Barack Obama made remarks identifying himself with the plight of the Florida teenager who was shot and killed last year during a confrontation with Zimmerman, a neighborhood watch volunteer. Zimmerman, 29, said he fired the deadly shot at the unarmed boy in self-defense, and he was acquitted July 13 of second-degree murder and manslaughter charges. The verdict sparked protests and calls for federal officials to charge Zimmerman with violating Trayvon Martin's civil rights. Federal officials are reviewing the case. Eleanor Holmes Norton, the congressional delegate for Washington, D.C., and one of the panel's organizers, said in a news release that it is time for the nation and the African-American community "to bring our black men and boys to center stage." "We seek a society that does not define black men and boys, but allows African-American males to define themselves," Norton said in opening remarks. Rep. Danny Davis, D-Ill., co-chair of the new caucus, said the aim of the coalition is to keep highlighting issues that impact and influence the conditions of black males and keep the issue in front of people so there will be understanding. For example, Davis said, there are few male African-American teachers in elementary and primary school, so some black boys never see someone who looks like them involved in education and thus grow up perceiving education as a female pursuit. "Fifty years after the March on Washington, it is an unfortunate fact that today young black men are still more likely to be unemployed, to be expelled from school, to be stopped at random on the street because they have been profiled, to be sent to prison, to not have access to regular quality health care, or to have suffered gun violence," Davis stated in a news release. The unemployment rate for black men 20 and over was 13 percent in June compared to 6.2 percent for white men in that age bracket. The unemployment rate for black males and females 16 to 19 years old was 43.6 percent last month, compared to 20.4 percent for whites, according to the Bureau of Labor Statistics. Also on schedule to speak were David Johns, executive director of the White House Initiative on Educational Excellence for African-Americans; Georgetown University sociology professor Michael Eric Dyson and Kweisi Mfume (kwah-EE'-seh oom-FOO'-may), former Maryland Democratic congressman and former NAACP president. Later this week, members of the Congressional Black Caucus were to convene a summit in Chicago to consider solutions to the issue of urban gun violence. Follow Suzanne Gamboa on Twitter.